I saw a delightful thing today. 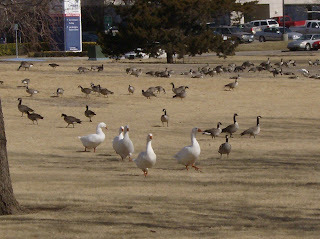 The mad geese in the park, who normally chase anything with two legs that comes within sight of them, were being chased. Seriously, they were running for their lives. From a four-year-old girl. Hee hee hee! You know, I always hear from people that their second grade teacher was really mean. (And I know for a fact that mine was!) And now I know why. Yes, we are teaching first & second graders this term in Bible class. Technically, we are not actually teaching them; we are "journeymen," meaning we travel from room to room with the children. But it is a lot of fun. And our kids are very cute. I really am determined to keep this blog ahead of Lubbock Daily Photo in terms of number of posts, at least in part because I've had this one for much, much longer! So yesterday we Raced for the Cure. This was my first 5K (3.1 mile) race, because last year I walked the Race. My first running race since junior high track was two weeks ago, at the West Texas Running Club's Shallowater Stampede, in which we ran the 2 mile. The entire cross-country team from Shallowater Middle & High schools is required to run the Stampede, so there were a lot of people running (184, to be exact). We chose the 2 mile because our other option was the 10K (6.2 miles) and we haven't had a decent long run in a while, so we thought that might be sucicidal. Anyway! These young and energetic teenagers started off very fast, and like a dummy, I did the same thing. So my first 1/4 mile was fantastic, only to be followed by 1 1/2 very unpleasant miles. On the last 1/4 mile I sped up, as you do, mostly out of a desire to be done with this race. There was a high school girl who I had been leapfrogging with for most of the race, but she reached much deeper than I on that last stretch and really took off, beating me by 13 seconds. Some of the aforementioned young and energetic crowd were fully recovered from their race and were standing at the side cheering, and one middle-school boy shouted by way of encouragement, "Go on! Catch her!" I started laughing because there was nothing else I could do at that point, so he shouted after me, "You're supposed to sprint at the end!" I had no breath left to shout back, "Hey, kiddo, I am sprinting!" I finished in 21:33 (a 10:47 pace), coming in 109th out of 118 runners, and just under a minute behind Chad, who finished in 20:39. He probably would have finished better, but he lost his head even more than I did at the beginning, and had to stop and walk before falling back to run with me for a while. He finished fourth in his age group, and I finished fifth in mine. So that was the Shallowater Stampede. Fast-forward two weeks to the Race for the Cure, in which my goals were: 1. Don't be so stupid at the beginning; and 2. Finish in 37:12 (a 12-minute per mile pace). So I went out easily at the beginning, a bit faster than I would just running by myself, but not trying to keep up with the faster runners ahead of me. The course was a 1.55-mile loop, so on the first lap I didn't stop at any of the water stations. The second lap around, the first water station was out of water, and so was the second one, so I had to wait a lot longer than I would have liked to get water. But once I did, I definately got my second wind, so I was able to dodge around all those who had stopped to walk, speed up on the final straight, and sprint to finish in 36:36. (Which, for those not counting, was 36 seconds faster than my goal). So it was a good day for me. Well, I'm sure I've lost everyone completely with such a long description. Stay tuned; our next 5K is in two weeks! So, we went to Pueblo a couple of weeks ago to see Phill & Keely. Turns out that Pueblo is a nice little town. Actually, it's not even that little. ( I have no idea if the pictures will stay where I put them, or if the captions will match up with the pictures, so this may be a bit of an adventure to read.) Shae came with us, since she had not been up to see them all summer. I felt bad for her, because we are two of the most boring people on the planet, and also because the back seat of our car is kind of loud. (It is a standard, after all.) However, she is quite the resourseful young lady, and like every other teenager I know, she has a phone with which to text people. So we didn't quite bore her to death. Anyway! Phill & Keely live near a park, which we wandered around in a bit. And there is a riverwalk through the middle (I guess it's the middle) of town. I'm going strictly from memory here, but I'm pretty sure Keely said that Texas once stretched as far as the Colorado River (next to which is the aforementioned riverwalk), and Phill was quick to point out that he was born on the non-Texas side. However, as soon as he went home from the hospital, he was back on the Texas side. It was taken from some distance away, obviously, but there it is. I did not, however, run into Daniel Jackson while I was out. (Which is hardly surprising, since the series is filmed in Canada, and Michael Shanks is, in fact, Canadian.) Sorry, Neesee. Also it turns out that Carter was wrong; not only is there a zoo in Colorado Springs, but it is on top of Cheyenne Mountain itself! Carter must have been under the influence of something. Or perhaps she just didn't want to go to the zoo. And there was no further trail to follow, because we had chosen a loop that would take us right back to where we started, but there was a nice view from here. So, once safe from serious injury and fatality, we went to the visitor centre across the road from the park, where we ran into some friends from church! They had decided spur-of-the-moment to go up to Colorado for the weekend, and stopped at the visitor centre at the same time we did. After all that climbing and visiting (and a stop off at some shops) we headed off to another park to see a balloon festival. However, those dark clouds we saw precluded any taking off, hovering, or glowing that the pilots might have done, so we had to content ourselves with "Candles in the Park." So that was our Saturday. On Sunday after church, we joined Phill's family at his parents' cabin in the mountains. And Chad got to shoot things. On Monday we made our way home, but we took a wrong turn in New Mexico and added an hour to our trip. Oops. I felt sorry for Shae, but she assured us she is well accustomed to her brother-in-law's rather unusual sense of direction, so the detour was not a problem. Also, it turns out she goes to bed later than we do, anyway! So we weren't keeping her up. I have so many things to blog about from the past few weeks, I get discouraged just thinking about it! I don't even remember what I wrote about last. Sheesh. So, to recap (briefly): We went to Colorado over Labour Day weekend, ran in our first West Texas Running Club race last Saturday, saw A Midsummer Night's Dream (also on Saturday), and started a new term of teaching Sunday School on Sunday. Except we aren't actually teaching. So I will come back and cover all those later.